As a member of the Justice League, you are the last line of defence to protect billions of lives from the worst of horrible foes. Will you make the difference? Will you secure the safety of mankind? With this Superman set for Hero Dice you join the Justice League as the Man of Steel. Gather your friends around you, roll the dice and battle villains with your Super Strength. 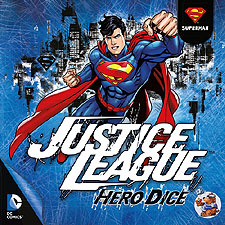 Justice League: Hero Dice – Superman is a cooperative game. There are several sets available. Each set enables you to play one hero from the Justice League. Each set has material for one player. Multiple players can play, with a set for each player (and both can play Superman, or each a different character).